Program your HET01 timer switch for security and energy saving. Program the lights in your bedroom, hallway, bathroom, garage, closet, outdoor lights, porch lights and other motors. 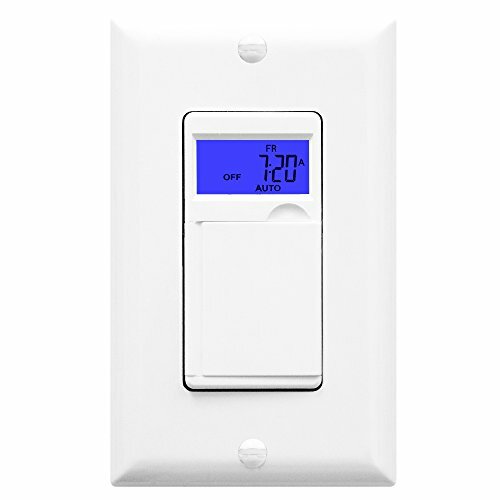 HET01 wall timer switch can be also used to program outdoor sprinklers or bathroom/ceiling fans. To deter unwanted intruders while house is unoccupied, turn on the random feature mode and the lights will turn on and off at random set times. To conveniently change the time difference for day light savings time, press and hold the DST button and the time setting will be corrected to match current time. Enjoy the security, convenience, and energy saving from HET01 wall timer switch. BACK LIGHT FEATURE- Digital blue back light display to easily read and program timer switch at the darkest areas. Program your indoor and outdoor lights, fans, sprinklers, and motors to turn on and off automatically at the preset time. Press the cover and HET01 can be used as a manual light switch. 18 DIFFERENT TIMER OPTIONS- Set 18 different on/off timer settings and let HET01 wall timer do the rest. While traveling, turn on Random Feature setting to program your lights to turn on and off at random time frames based on your schedule to DETER UNWANTED INTUDERS. Press DST for day light saving. BATTERY & WALL PLATE INCLUDED- In case of power outage, HET01 has a built in Ni-mh battery to secure preprogrammed time settings. Decorator wall plate is included for modern aesthetic. MONEY BACK GUARANTEE: Save energy and money when use for ceiling fans, lights, motors, and sprinklers. 100% satisfaction guaranteed or with 1 year warranty. NEUTRAL WIRE REQUIRED - US & Canada UL LISTED safety checked. Resistive 15A/1800W, Voltage 120VAC, 60Hz, Tungsten 1200W, Fan motor: 1/2HP. Single Pole only. Not for 3-way use.